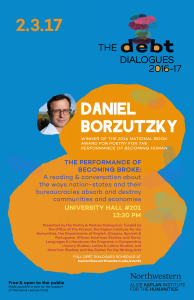 Please join the Poetry and Poetics Colloquium for a reading titled, “The Performan ce of Becoming Broke” by Daniel Borzutzky, on February 3rd, 12:30pm in the Hagstrum rm, (University Hall 201). Daniel Borzutzky grew up in Pittsburgh, Pennsylvania, of Chilean heritage. He has published numerous collections of poetry, including, The Performance of Becoming Human (2016), winner of the National Book Award; In the Murmurs of the Rotten Carcass Economy (2015), The Book of Interfering Bodies (2011); and The Ecstasy of Capitulation (2007). Borzutzky has also translated a wide array of contemporary Chilean writers, including the poet Jaime Luis Huenún’s Port Trakl (2008), Raúl Zurita’s The Country of Planks (2015), and Galo Ghigliotto’s Valdivia (2016). His translations have won the support of the PEN American Center, and the National Endowment of the Arts. He has taught at the School of the Art Institute of Chicago, Koç University in Istanbul, and Wilbur Wright College of the City Colleges of Chicago.